He is Abid, He is Sajjad. The day of the Ashura has come, the night of sorrows has gone. His caravan is on it’s way to Shaam. This is Sajjad’s Ashura, this is Sajjad’s battle. And he speaks to them. of the spear that pierced that chest, of the blood that purified that sand. Each fragment individually bearing witness to the unity and justice of Allah. Of his delicate skin and gentle breath. 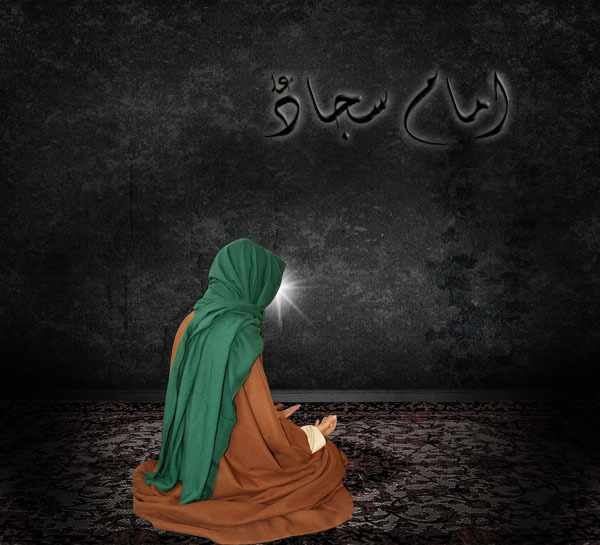 Protected the body of Hussain, wordlessly announcing the rightfully appointed Imam of his time. Of the unfulfilled promise, the loyalty, and the loss. Of the aftermath, the burning tents, the snatched earrings, the bruised face, the lost home. Of the brother who will be so desperately missed. Of the sacrifices of the father, the brothers, the sisters, the mother. now paraded through bazaars and cities. With the tears of sisters and aunts and mothers. Is it any wonder that he cries a flood? Do they surprise you, his tears of blood? Who does he talk to, this Abid, this Sajjad? Who does he turn to, save for God? He speaks to Allah of Akbar and Abbas. He speaks to Allah of the grief, the loss. He speaks of them all, one by one, name by name. But in his conversations, there is no complaint. There is no lament, no grumble. And no objection. Instead there is contentment, and gratitude, courage and conviction. And there is an invitation. Come and listen, come and pray. Learn from us how to find solace in strife. There is no death if your heart is pure. This design is the work of God. He knows this journey, he knows the direction. He knows that he carries the promise of perfection. It has been since the very first dawn. His tears are gems, do not mistake them for simply sorrow. They are our shifa’a: guiding our paths, illuminating our tomorrow. Ailia H. Rizvi is currently working on an MA in The Study of Contemporary Pakistan at SOAS (The School of Oriental and African Studies ), focusing on Muharram-centric cultural and literary production and how it informs Shia identity in Pakistan.She holds an MA in English Literature and had been teaching writing and literature at a community college previously.